What a funny situation. On 17th April 2010, I started reading MCL! Thanks, Phillipa, for two cardboawesome years!! This has turned to my favorite comic!!!!! Universal truth: At some point before its death, every webcomic, without exception, breaks the fourth wall, and most use out-of-panel situations to do it. 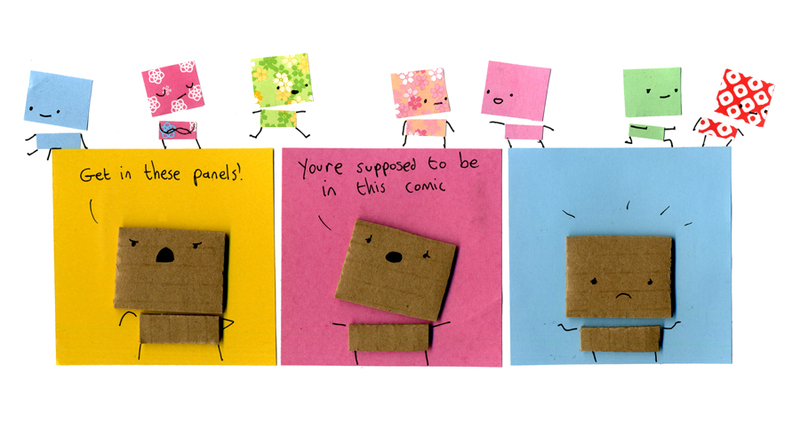 Congratulations, My Cardboard Life, you’re all grown up! PS I think you’ve probably done that before, but I didn’t think to say this then. Oh, no, Red Check, watch out for Green! What if one of them fell off? No, I think they’d hit the bottom of the screen. I hope. They’d better be careful, just in case. Blue over there on the left is freakin’ adorable. I agree, man. Sittin’ on the ledge. Philippa, I love it when you break the fourth wall.